The Race: Things were close going into the final stage. Alberto Contador had an eight-second lead over Chris Froome, while Froome led Contador in the points classification by two points. In the young rider classification Wilco Kelderman had a 1min 12sec lead over Romain Bardet. The mountains classification was not so volatile. Alessandro de Marchi led Egor Selin by 38 points with a total of 55 mountains points on the table today. Before the race was even 30 km old, 23 riders broke away. With riders such as Andrew Talansky (3rd in GC) and Ryder Hesjedal in the group, Sky and Saxo-Tinkoff worked to conrol the gap. On the Col des Saises, Froome attacked and took 16 riders with him, including several of the big guys including Contador, Wilco Kelderman and Vincenzo Nibali. At km 75, the time gap was 1min 55sec between the Talansky lead group of 21 riders at the front and the Contador/Froome group, and still anouther two minutes back to the peloton. As the Côte de Montagny loomed, Sky worked to chase, trying to bring Froome up to the lead group with Talansky, but Froome and Contador refused to work together, Contador (without teamamtes) telling Froome to chase. The gap to the Kelderman/Talansky group at km 105 was 2min 21sec. 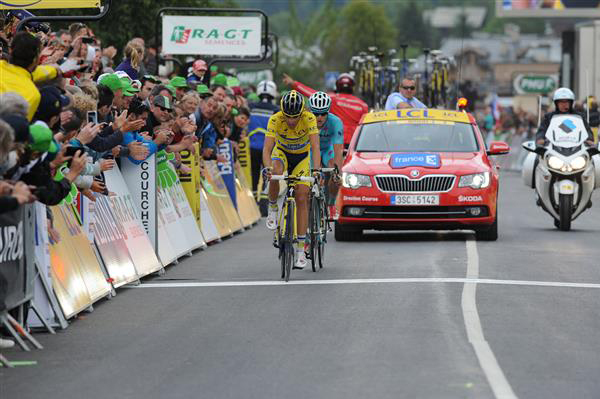 Nibali, seeing the deadlock, took off and was soon a minute in front of the Contador/Froome group. Ag2r had several riders in the front group and slaved away to advance Romain Bardet's cause. Contador went alone on the Montagny, eliciting no reaction from Froome. Contador proceeded to ride like a man possessed, racing through the riders of the front break who had been dropped and closing the gap to the Talansky group. With 16 km to go, he was 93 seconds behind the leaders. Talansky, looking to burgle the tour du Dauphiné, descended the Montagny like his hair was on fire. What a race! The chase was on. With eight km to go Talansky was fighting to stay away, Nibali chasing at less than a minute, the Contador group with Leopold Konig for help at 70 seconds and Froome looking out of gas, more than three minutes behind Talansky. Four km to go: Contador, going flat out, was 54 seconds behind. 2.5 km to go, the gap grew out to 1 minute! 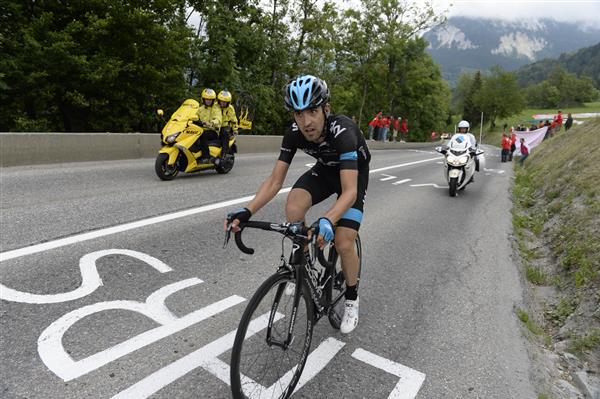 Contador was losing ground and the Dauphiné! Contador blew by Nibali, who looked to have cracked. Up Front Mikel Nieve and others left Talansky to get a stage win, taking the time bonuses out of play. 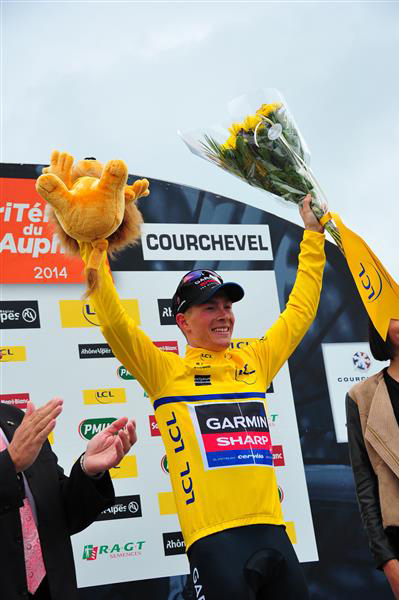 Talansky did it! 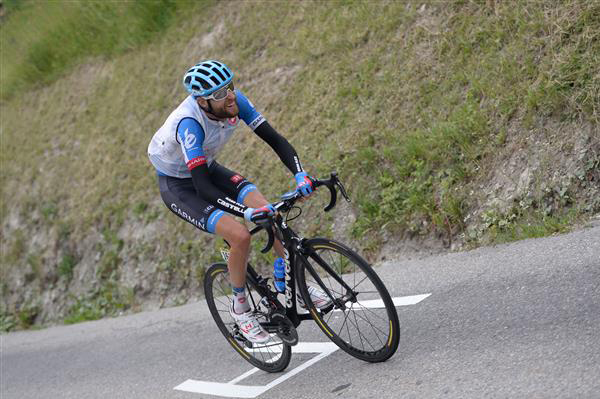 The Garmin-Sharp rider commited the hold-up of the year. Contador lost ground in the final kilometer. 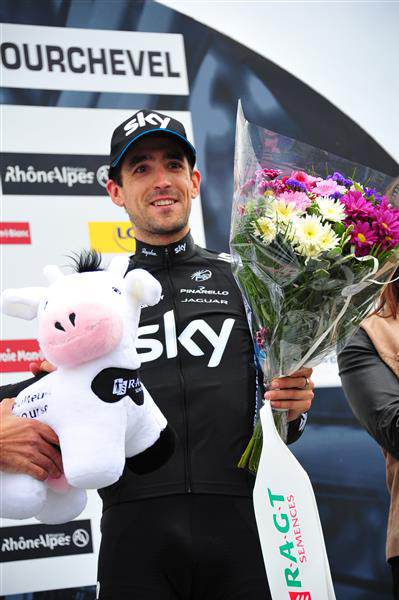 Mikel Nieve held his lead and won the stage. Alberto Contador on his solo chase of the Talansky group. In the closing kilometers Andrew Talansky was able to increase his gap back to Contador. Vincenzo Nibali tried to take advantage of the stalemate between Froome and Contador, but cracked badly in the final kilometers. Chris Froome (green jersey) didn't have the suds to contain the other attackers today. Mikel Nieve sets out to win the stage. Wilco Kelderman was the final Young Rider Classification winner. Ryder Hesjedal buried himself for Talansky today. Andrew Talansky and Jurgen Van den Broeck finish stage eight. Alberto Contador and Jakob Fuglsang finish. I think this photo of Joihn Gadret finishing explains how hard this Dauphiné was. 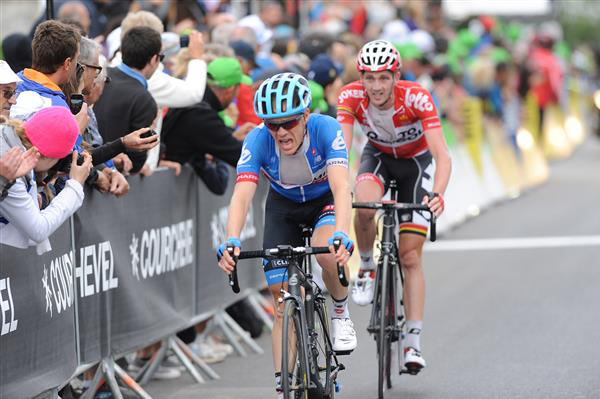 Winner of the 2014 Critérium du Dauphiné, Andrew Talansky. 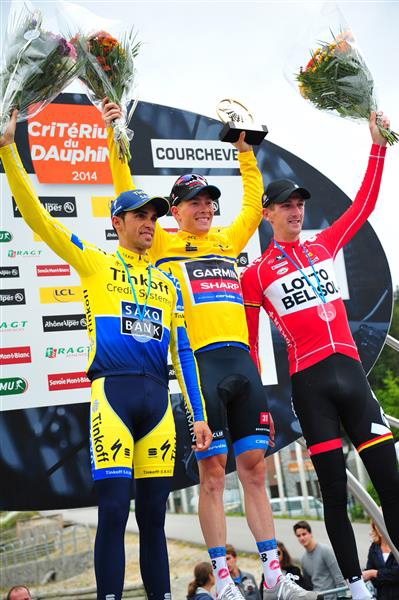 The final podium, from left: Alberto Contador, Andrew Talansky and Jurgen Van den Broeck. The Race: The organizers call this the Queen Stage, and I have no argument with that. With five ascents rated Category Two or higher with the final pair of passes classed "above categorisation", this will really be a day to test Chris Froome and see if the injuries he sustained in his stage six crash will impair his climbing. 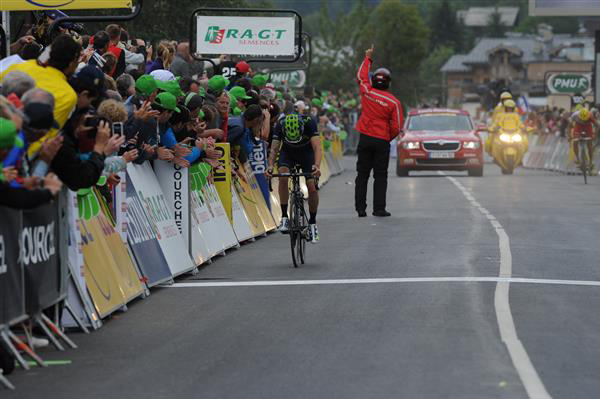 The two final climbs are in Switzerland. Early on, a fourteen-man break went clear on the Côte des Gets. Lieuwe Westra, in 25th place and down 5min 59sec was the best-placed rider in the escape. By the end of the Col du Cordier's descent the break's gap was about five and a half minutes. Sky put several riders at the front on the Forclaz with Froome and Contador close together near the front of the peloton. Further up, Yury Trofimov had again set off alone looking for another stage win. 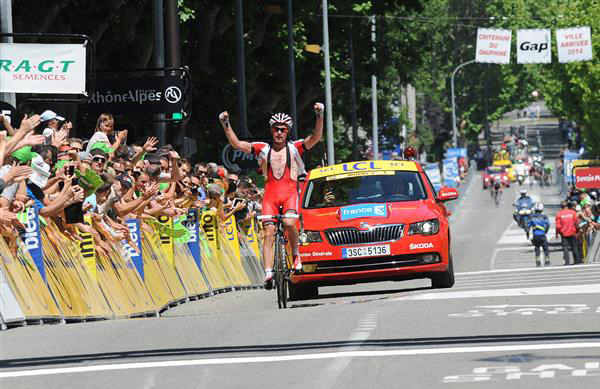 On the descent, Egor Selin joined his Katusha teammate Trofimov to form a two-man break. On the Finhaut-Émosson, with seven kilometers to go, Contador had only one teammate but Sky had four riders helping Froome at the front and they were setting a fiery pace. Up front the Russian duo had four and a half minutes. Kelderman and Nibali were sticking close to Froome. With two kilometers to go the Russians still had three minutes. None of the contenders had yet tried to test Froome with an attack. As the Katusha duo look to have sealed the stage win, out of nowhere Lieuwe Westra, a member of the original break and probably burning from his second place the day before, came out of nowhere and took the stage. Bam! With 1.1 km to go Contador blasted off and opened a significant gap. Froome, sitting on Richie Port's wheel, looked terrible and initially didn't react. And then he went, chasing the Spaniard with obvious determination and desperation. He couldn't close enough of the gap and Contador takes over the lead. The Race: The first 40 kilometers were jumpy with constant attacks until 16 riders (with Jens Voigt, of course!) were able to go clear. 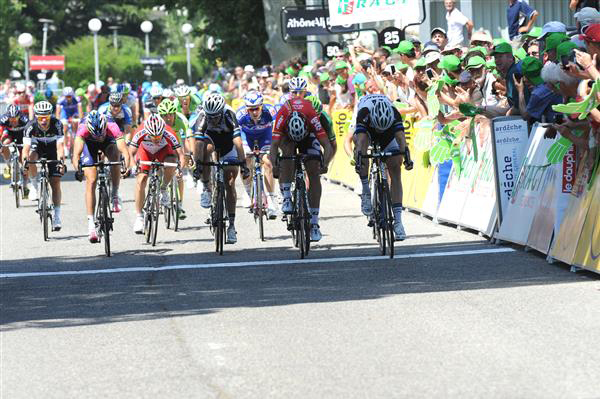 A gap of five and a half minutes had been allowed but first Sky and then FDJ went to the front to control the break. With 25 km remaining the gap was slightly more than four minutes. Sixteen riders in a break meant someone would get ambitious. Lieuwe Westra jumped, quickly to be joined by Pim Lightart and Jan Bakelandts who clawed their way off the front of the escape. with 17 km to go, the strong trio had 20 seconds on the break and were three and a half minutes ahead of the peloton. Westra and Bakelandts shelled Ligthart. Further back, a crash took down race leader Chris Froome, delaying the waiting peloton and allowing the gap to the front duo to grow to nearly five minutes. Shortly after the red kite Westra jumped, trying to force Bakelants into the barriers. But Bakelandts came by to win stage six. Chris Froome, showing the effects of his crash, finished with the main group to conserve his 12-second lead over Alberto contador and Wilco Kelderman. The Race: What a day! Hot weather today. Yesterday Sky seemed to show signs of tiredness. Today, on the descent of the Côte de Laffrey, Alberto Contador (with temporary help from teammate Sergio Paulinho) attacked the Yellow Jersey group and quickly established a gap of over a minute. Earlier a 17-man escape had gone clear and with 20 km remaining Contador had started picking up help from those who had been dropped (including French champion Arthur Vichot) from the original break. Sky, understanding the seriousness of the moment, was at the front of the pack (about 18 riders strong) laboring to bring back the fleeing Spaniard. Contador couldn't get enough help from his fellow breakaways and was back in the Froome group with 16 km to go. Meanwhile, there were still riders of the original break off the front with Simon Spilak alone ahead of everyone. Spilak motored to the finish to win the stage, making two stage wins in a row for Katusha, while the remaining breakaways were mopped up. Back in the Yellow Jersey group Wilco Kelderman and Adam Yates attacked the Froome group. Sky mounted a frenzied chase, but Kelderman (with Yates) stayed away to grab the six-second time bonus for second place, making him tied with Contador in the GC. With lots of work, Froome preserved his overall lead. 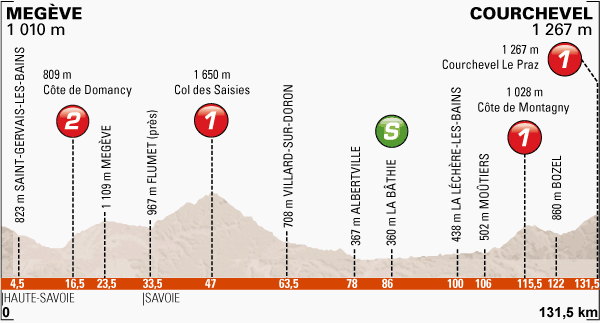 The Race: The organizers called this a day for "butterflies in the stomach" because of the highly technical descent of the Col de Manse shortly before the finish in Gap. Overall they considered it a day made for adventurous breakaways with both the curvy roads between Nyons and Veynes (roughly the stage's middle third) and the hair-raising ride down the Manse. Early on, a thirteen-man group escaped and was allowed to gain a five-minute gap. By the Col de Manse the break was partly reeled in, having a couple of minutes in hand. Sky did the hard work of controlling the peloton while the break fragmented on the climb. Katusha's Yury Trofimov (a good descender) attacked the break and went over the top of the Manse about two and a half minutes ahead of the yellow jersey group with lots of riders scattered in between. Trofimov's race down the difficult mountain road was completely insane. He held his lead on the short flat section leading into Gap and took a wonderful, well-earned solo win. Chris Froome maintained his 12-second lead in the GC over Alberto Contador. 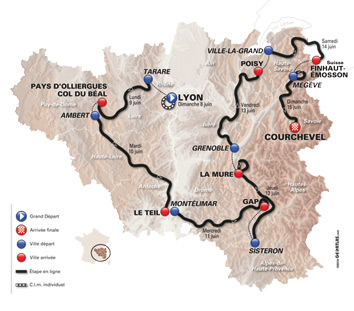 The Race: Stage 3 was the 2014 edition's longest stage with two second-category climbs followed by a flat run-in to the 450 meter-long Allée Paul Avon finish. It was a hot day but that did not deter a three-man break from staying away until the final ten kilometers. Then other attacks fired off, but it came down to a big sprint. Nikias Arndt barely won the stage. French super-sprinter Arnaud Demare managed only eighth place. 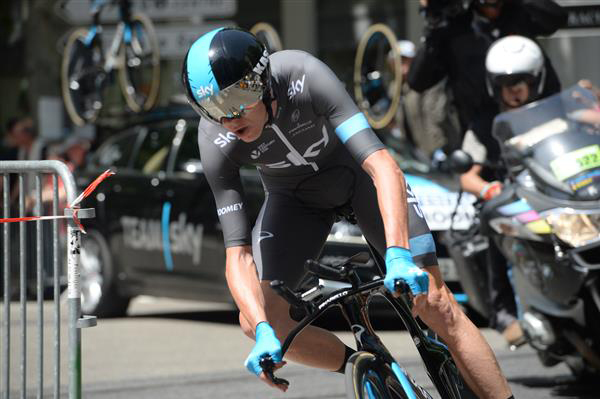 Christopher Froome remains the overall leader with a 12-second lead over Alberto Contador. The Race: All the real action was on the final ascent, the above-category Col du Béal where the day's break was caught and the contenders unsheathed their broadswords. After Sky's Mikel Nieve reduced the front group to a small elite of about six riders, several riders tried to escape, including Wilco Kelderman, Andrew Talansky and Jurgen Van den Broek. 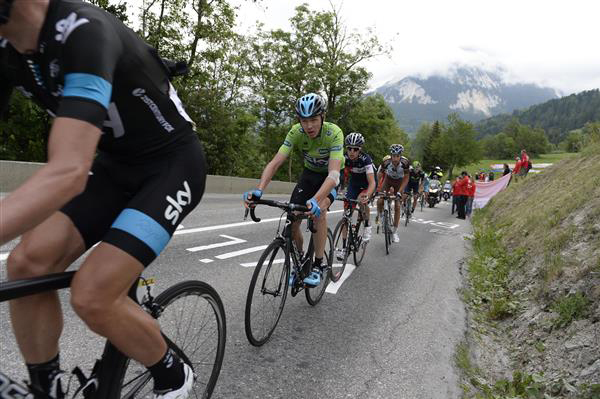 But Chris Froome was constantly on guard and did the work of retrieving each attack. 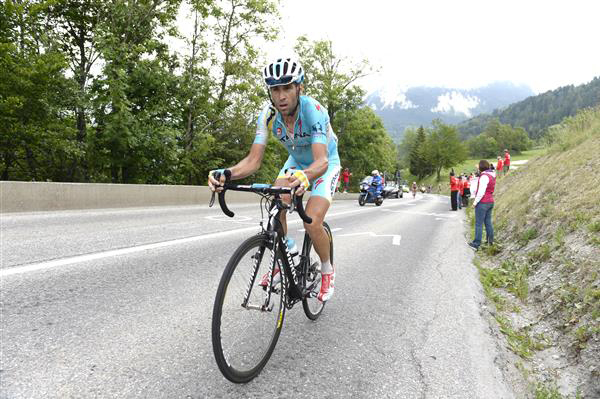 Of the three most serious contenders (Froome, Contador, Nibali), Vincenzo Nibali showed the greatest weakness. He would be dropped and then claw his way back. Alberto Contador refused to work, just following Froome, seemingly without any stuggle. Under the Red Kite Froome attacked a couple of times, each time taking only Contador. 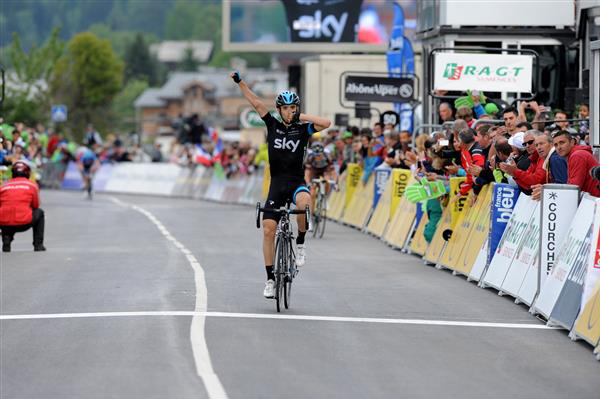 Froome couldn't drop the Spaniard, but he did win the stage and retain his overall lead. 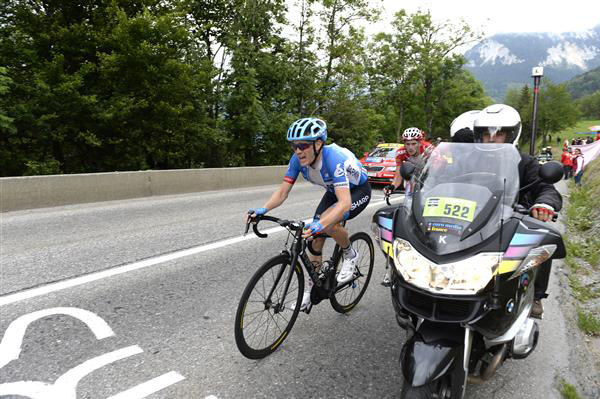 The Race: Chris Froome's sparkling condition was on display during the Dauphiné's technical first stage when he beat all the other contenders (notably Alberto Contador and Vincenzo Nibali) by significant margins. Froome said his resounding win was a surprise, but I don't believe it and if Froome was surprised by his win, he was probably the only one. Alberto Contador, who was tenth in the Dauphiné last year and is looking to peak for the Tour de France, pronounced himself happy with his second place. Tomorrow's stage is a hilly challenge with six categorized climbs, the last of which is a finish at the top of the HC-rated Col du Béal.